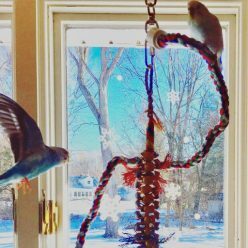 The budgies have their own room – finally! Quite a while ago I started thinking seriously about moving the budgies into their own room. I did some crowd-sourcing and readers were split on whether it was a great idea or would be a total disaster. I got hung up and probably too concerned about the outcome, considering it wouldn’t have to be a permanent situation! Toby’s continuing obsession with her “papa” pushed the issue and we finally decided that we all needed a bit of space. At long last the budgies have had their own room for several weeks now. 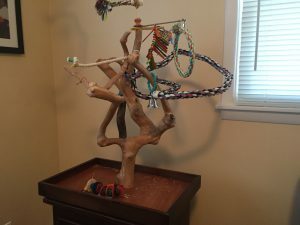 In their new room, Toby, Kelly and Kevin have their cages, and they also have a fun play zone with the Java tree and a hanging Boing . They really enjoy all of the added play space. I’m working on a way to get them better window access, but we’re not all the way there yet. I was worried that this would keep them separate from the humans and they would be isolated, but in practice it’s expanded their territory, which is awesome! 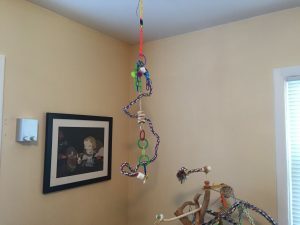 After a few days they were very comfortable flying back and forth from their room to their play area with Playstand where the cages used to be in the dining room. 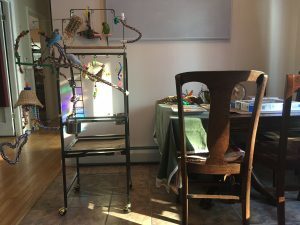 They will spend literally all day chilling out on the Playstand , and at their window perches in the kitchen and living room. I keep the food cups full and it’s convenient having the table right there to put fruits and vegetables out and water so they don’t get thirsty. So, the budgies are definitely not isolated and in fact they get even more time out of their cages then they used to. Having their cage space separate from the play zone made for an unexpected expansion of “neutral territory” so there’s been a reduction in knock down drag-out fights between the girls. We are still struggling with Toby being unable to leave Patrick alone and she will defend him like he’s her property, but we are now well into springtime so I am sure hormones are a factor. As I had hoped, they are getting a lot better sleep now too. We are able to put them to bed between 6:30pm and 7pm and since they are farther away from the kitchen and living room I don’t have to worry as much about keeping them up cooking or watching television. It’s also nice that on the rare occasion we burn something in the toaster over I don’t have to fret about smoke inhalation. Patrick’s allergies have been easier to manage since the move, but I do have to admit that I feel like I’ve got a lot more to clean up after, since they have increased their territory and mess zone. Toby has had one night terror since the move and I was able to hear it and respond really quickly, so that’s not much different either. So far so good! The positives of much better sleep for the budgies and being able to make an ice cream sundae after 7:30pm for the humans are worth the increased cleaning for sure! Sometimes it does feel like it’s the budgies’ house and we are just living in it, but I suppose that was inevitable once they outnumbered the humans. Your article did make me smile. 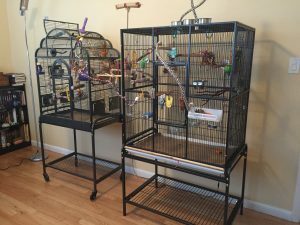 Instead of the budgies having their own room, they now have two rooms! Wouldn’t change a thing, of course, but they have certainly extended their conquered territory! 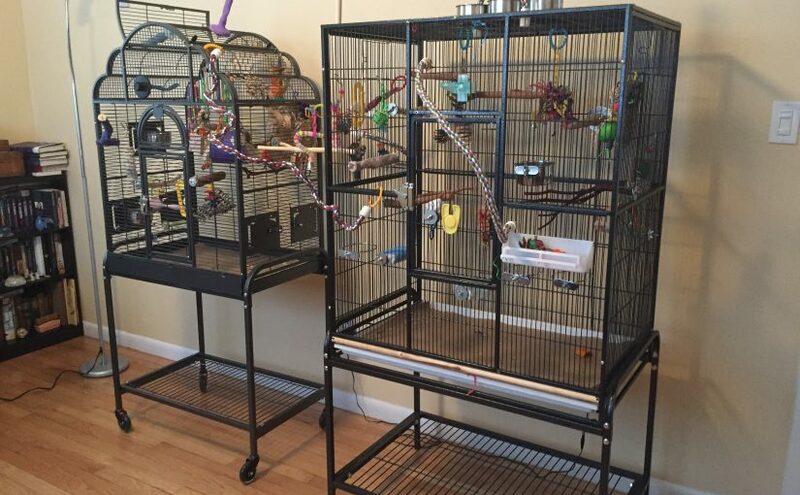 It looks like you have an awesome space for your birds! I enjoy having a separate parrot room and the birds (seven of them) have each others company and are ok with not being in the midst of everything all day. Its all about finding a balance! So true, balance is key. I do think that they are totally happy having a quiet place to relax, especially during molting when they want a bit of extra rest. LOL @ you living in their home. 😀 Well done – it sounds like a good move/set up.